With this MRLANDLORD.COM Forms CD, you can now print over 200 rental forms that will help you make more money every month and take total control of every rental situation! This handbook has been revised, updated and expanded. 44. Welcome to the Neighborhood! 123. Sorry We Missed You! 163. Receive Your Full Deposit Back When You Move! Plus Two Dozen More Rental Forms. This program operates as a stand-alone WORD program and it is easy to use. You can edit, delete or customize and save any of the wording on the forms. And of course, you can print any of the forms. 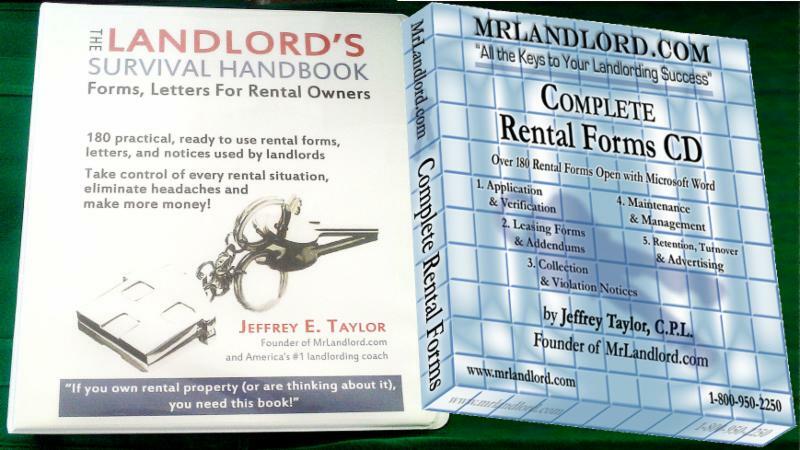 This CD program is a great resource, which includes every possible form or letter you could need for most any rental situation, (200+ forms total), a "must have" for all mrlandlord.com visitors and subscribers. FREE BONUS, when you order this RENTAL FORMS CD program, you will also receive a FREE copy of the Handbook (Hard Copy Version) of all 200+ rental forms ($59.95 bonus value). Personal note from Jeffrey Taylor: It's astonishing what will happen just by using the right rental forms. You will gain complete control of every aspect of your rental management. The forms work like magic! I have been compiling, perfecting and updating these forms over the last 30 years, because I am convinced that the rental forms you use to communicate with your residents will help determine the level of your rental success! I will reveal through these forms the absolute most effective ways to communicate with your residents that will put more money in your pocket, help you take control of every rental situation, and keep your residents happy, cooperative and staying in your properties for years!" The Rental Forms on this CD-rom gets high praise from my friend and colleague Leigh Robinson, who wrote the bestselling book LANDLORDING. Here's what Leigh has to say about the FORMS - "Good forms make the good landlord a better landlord, but they require a lifetime of writing and refining. Now comes Mr. Landlord, Jeffrey Taylor, to share his many good landlording forms developed over his lifetime for all of us. Bless him!" Receive this Rental Forms CD that will make you more money money each month, guaranteed or your money back. The regular price of the FORMS CD is $199.95. However, you can take advantage of this special offer to also receive the free hard copy version ($59 bonus value) of all the forms in a binder. Receive both for only $179.95.. Take advantage of this limited time combination offer! (Save $80!) Order this Rental Forms CD program now plus receive the the hard copy Binder of the Handbook of 200 Rental Forms.